Arabic is the fastest growing language in the U.S. 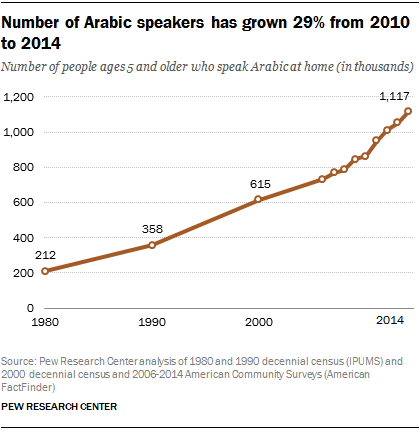 The number of people ages 5 and older who speak Arabic at home has grown by 29% between 2010 and 2014 to 1.1 million, making it the seventh most commonly spoken non-English language in the U.S. Meanwhile, the number who speak Spanish at home has grown only 6% over the same time period. Translating survey questionnaires is a tricky endeavor because it can be difficult to express the same meaning across two languages and cultures. But Arabic presents unique challenges because it is read from right to left on the page (the opposite of English and many other languages), the letters are connected like cursive writing in English, and, because it uses a different alphabet, words such as names can’t always be directly transliterated into English. Even if the questions are translated accurately, the visual elements of the survey may not necessarily transmit the same meaning as in English. For example, symbols such as an “X” to mark a response carry different connotations in different cultures. The census is usually a self-administered survey (that is, respondents complete the questionnaire on their own, on paper or online) and research shows that visual display can have a large effect on survey responses. In addition to translating the text of the questionnaire, the new study indicated the need for thoughtful formatting of the questions and answer write-in fields. 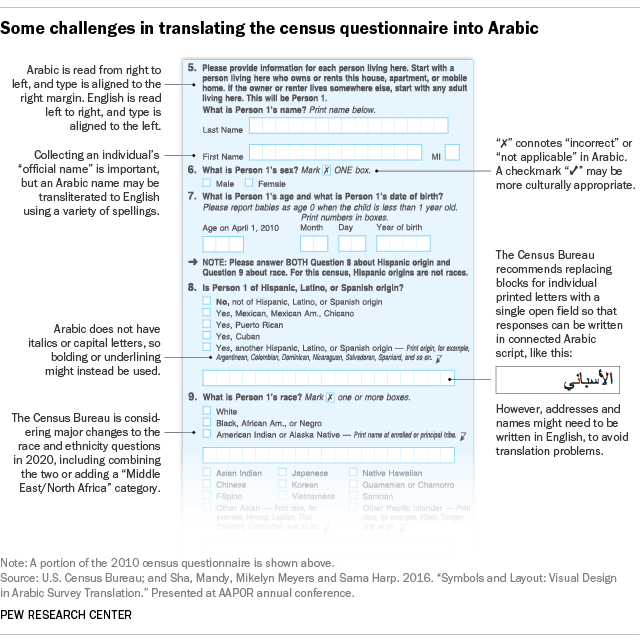 Since Arabic is written right-to-left, the study recommends that most of the census form’s questions should be aligned on the right side of the page. Also, while the English questionnaire uses capitalization or italicization to emphasize or de-emphasize text elements, there are no distinct capital letters or italicization in Arabic, so the study recommends that other methods be used to achieve a similar effect, such as bolded or underlined words. One key challenge is to determine when to require a response in English and when to allow an Arabic response. For example, the study recommends that the address fields require the respondent to use English, because an American address might not be accurately translated into Arabic. This requires, in addition to an instruction to use English, the use of inside borders in these text boxes and aligning the response options to the left side of the page for these items as a further cue to use English instead of Arabic letters.